Decals printed by Fantasy Printshop. 1/32 set includes vinyl paint masks for markings and canopy detonation cord. The BAE Hawk, introduced in 1974, ranks as one of the most successful 3rd generation jet trainers, with a large number of users worldwide. Their service with the Swiss Air Force, however, must rank as one of the briefest in the types history, lasting scarcely longer than a decade. The motion to purchase of an advanced trainer by the Swiss Air Force was initiated in the early 1980’s. 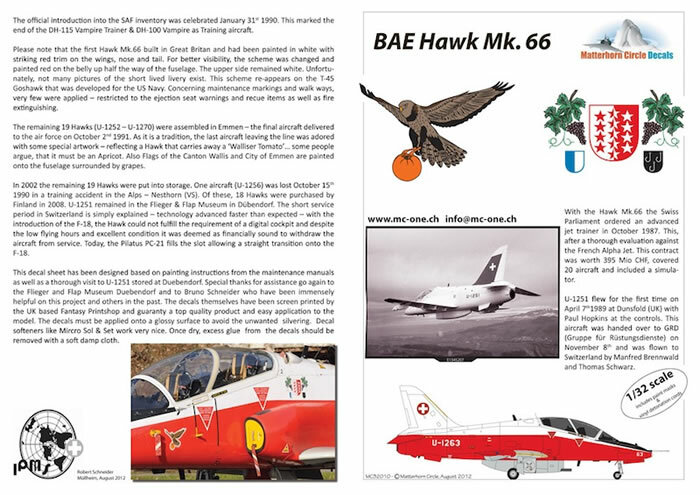 After a thorough investigation of the most suitable types available at the time, which included the French Alpha Jet, the decision was made to purchase the BAE Hawk Mk. 66, by the Swiss parliament in October 1987. Externally this type is very similar to the T1A used by the RAF, most memorably those of the Red Arrows. To permit live weapon training with cannon firing, the Mk.66 was equipped with a centreline belly pod housing a 30 mm ADEN cannon. To see these diminutive jets tearing through the jagged alpine landscape, their brief appearance punctuated by a sewing machine like burst emanating from cannon during live firing exercises at Axalp, was a sight and sound to remember. Of the 20 ordered the 1st aircraft, U-1251 (U= Übungsgerät or Trainer), was assembled at the BAE plant in Dunsfold, UK, and flown by Paul Hopkins. On 8 November the aircraft was handed over to the GRD (Gruppe für Rüstungsdienste / Group for Armament Services) and flown to Switzerland by Manfred Brennwald and Thomas Schwarz. 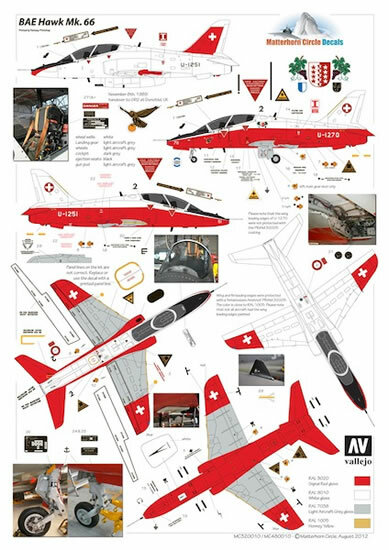 The type was formally handed over to the Swiss Air Force on 31st January 1990, which at the same time marked the end of the use of the Vampire (DH-115 and DH-100) as training aircraft by the Swiss. The remaining 19 aircraft were assembled from knock-down elements at Emmen, close to Luzern, with the last aircraft being delivered on 2nd October 1991. In common with the final delivery of other Swiss aircraft, U-1270 was adorned with special artwork, in this instance a Hawk carrying an apricot (or Walliser Tomato), as well as the coat of arms of Wallis, the City of Emmen, flanked by vine leaves. As stated, the Hawk only had a brief service with the Swiss Air Force, and without much public fanfare (in contrast to the DH Vampire or Hawker Hunter) the type was quietly withdrawn in 2002. Of the 19 remaining aircraft, 18 were sold to Finland in 2008, as these operate a similar type. The ostensible reason for the types withdrawal was that technology had advanced so fast, that with the introduction of the F/A-18C Hornet, the rather old fashioned cockpit of the Hawk meant that it was not suitable as direct introductory trainer. This task could be achieved more cost effectively using a modern glass cockpit equipped Pilatus PC-21. 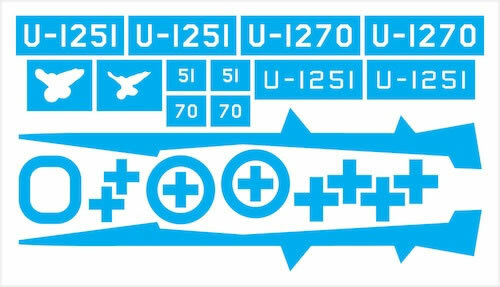 Another possible reason is that too few pilots were being trained to warrant the cost and maintenance of 20 jet aircraft, as the current complement of PC-21’s is only 6 aircraft! 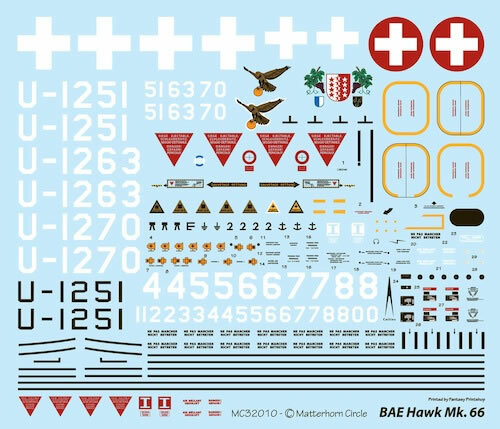 For this decal set, which ideally complements Revell’s new 1/32 Hawk kit, Robert Schneider of MC-ONE has done a superb job, with meticulous research and close examination of the last remaining type in Switzerland. As ever the artwork is of the highest standard, and the decals are excellently printed by Raymond Horwell at Fantasy Printshop. 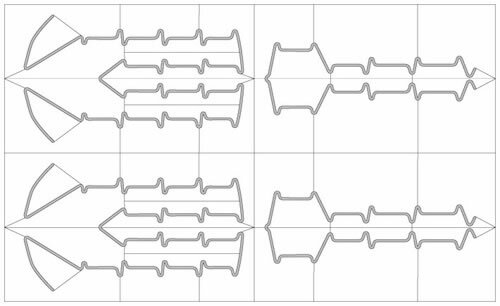 In order to ensure that the White of the Swiss crosses has sufficient density, this was printed in 2 separate layers. As such, there should be no bleaching of any red colour beneath. The 1/32 scale set is accompanied by a set of vinyl masks for the national markings, a very welcome addition, as sprayed on markings do look much more realistic in this scale, as well as a very intricate mask for he canopy detonation cord: another nice touch of added realism. The Hawk Mk.66 may have had a brief service in the Swiss alps, but it was a uniquely colourful variant, and in model form, will be an attractive addition to any collection. These decals are the ideal partner for such a venture.